Police officers from across Merseyside are wearing rainbow-coloured laces to kick-start awareness for this year’s Lesbian Gay Bisexual Transsexual history month. The initiative began today and sees the usual black laces worn by officers replaced by multi-coloured laces which will bear the rainbow colours often used as a symbol of representation by the LGBT community. Merseyside Police officials are hopeful that in changing laces they can successfully promote equality and diversity in an effort to eradicate discrimination. Officers of any rank are being given the choice of whether or not to wear the laces throughout the month as a show of solidarity. Deputy Chief Constable Andy Cooke said: “As a force we have already pledged to do everything we can to support members of the LGBT community and tackle homophobic and transphobic hate crime in Merseyside. 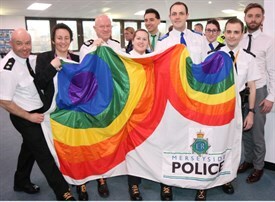 It is not the first time that Merseyside Police has been forthright in its support of the LGBT community, after flying the rainbow flag for the past nine years to mark International Day Against Homophobia (IDAHO). It will certainly not be the last, either, as Merseyside Police has established a hate crime investigation unit named ‘Sigma’ in the hope of focusing more attention on ending discrimination. The ‘Sigma’ group will be tasked with a number of things, such as evaluating how LGBT cultural events are organised in the city. They will also look into how anti-discrimination is discussed in schools and universities, and how local councils and emergency services work with charities to promote LGBT awareness.